Appears some EMDrive cavity shapes are just nodal sites of electromagnetic fields under resonance with added noise. It is like the recovery of the 3D object image from a piece of "hologram". Would exist a "master" shape of EMDrive cavity? I've searching for a cavity with a simultaneous spatial and momentum (reciprocal space) conformal symmetry, and to my surprise, it's cross section resembles the Mike McCulloch's fiber loop. Also thees simulations did not contain any kind of noise added to the model (please ask member "aero" for details on this sims, because he did it personally). I am very sorry to notice this again, but your drawing may tell you something but it tells nothing to the public. Please speak & draw in terms the public can understand. Also it seems you are using words without to understand the meaning of it (or you got another interpretation of it as most others have). Most of your posts are confusing. So please explain in plain words what you are meaning rather than trying to use false interpreted technical terms. To make the point clearer, no one wants you to be quiet or not to write. If you have ideas that might help to solve / explain the phenomenon in question, you are welcome. However please try to write your content in a way that other members can follow thees ideas, otherwise it is not really helpful. We want to able to discuss your points. In your opinion, what can produce a net thrust without mass output in the opposite direction? What do you think is the underlying principle? Do you think that your proposed form should lead to a higher measurable thrust? If so, why? Thanks, but your geometrical arrangements contribute little to the general understanding of the topic. 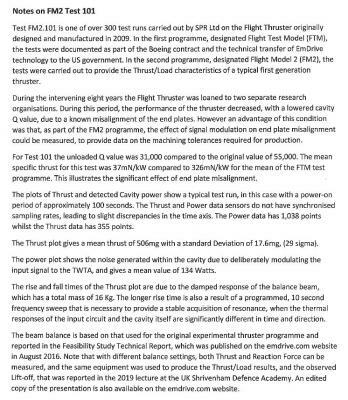 I have just got the OK from our client to release some typical thrust data and have attached it for your interest. I think this is the first time SPR has put raw test data into the public domain, so feel free to share it around. I will get it put up on our website soon. For those not familiar with the Flight Thruster SPR designed for Boeing, check here. Other data on this forum. Thanks Phil, nice to see some data that we can review, but one test out of 300 is not going to convince me or most others. How about posting all 300 in a spreadsheet? Roger has stated SPR completed the Boeing/DARPA/USAF Flight Thruster contract and was paid in full. Plus Roger stated Boeing confirmed the test data. Just my guess but maybe how that 10 years has passed, NDA's & contract limitations are expiring? Our 5N/kWe EmDrive like thruster will be commercially available to the international space industry in 2020. Best Ion Drive is approx 60mN/kWe. Approx 80x more energy to thrust efficiency plus no fuel mass. Accelerated mass KE & momentum gain cause photon KE & momentum loss/wavelength increase. CofE/CofM/N3 compliant. Runs from standard 28vdc satellite power bus plus 1553 control comms. I'll not be posting on this forum until my rotary test rig build is completed and I have data, either way, to share. If any post I have made has upset anybody, I apologise. Literally mathematically impossible. Propellantless thrusters break both conservation of energy and momentum by definition. The only exception is for force per power no more than a photon rocket due to special relativity (which allows massless particles to have energy and momentum) To claim conservation of energy and momentum, you would need something external to balance the momentum, something that you have never even proposed. You have been shown the math on this countless times. As to Shawyer's recent data, it does nothing to change the inconsistency of the previous data you shared from him. It shows force per power levels many orders of magnitude higher than any other experiment has approached, the dip at the beginning shows that claims about it needing an initial acceleration to get going are contrary to the data he has had (and therefore is just an excuse for why people who actually know how to eliminate major error sources from experiments have not found any significant thrust.) There simply is a lot of better data from better setups than Shawyer has ever shared and that data all clearly indicates that there is no signal down to orders of magnitude lower than his claims. Accelerated mass KE &amp; momentum gain cause photon KE &amp; momentum loss/wavelength increase. CofE/CofM/N3 compliant. Why do you have to post in such an aggressive way. It’s one of the reasons I’ve stopped looking on this thread. You seem to feel it’s your right to stamp on anyone on here who posts something you don’t agree with. Why do you have to post in such an aggressive way. It’s one of the reasons I’ve stopped looking on this thread. You seem to feel it’s you jump to stamp on anyone on here who posts something you don’t like, and have a strong desire to get one up over them. What exactly are you considering aggressive? Pointing out that someone has broken promises repeatedly yet keeps making the same ones over and over? Pointing out that someone blindly keeps repeating claims that are provably false to the point that they are self-contradictory? There is nothing in my posts about getting "one up over" anyone. This site is an otherwise excellent resource on spaceflight and related information. If someone posts complete misinformation* about the laws of physics, correcting it seems to be a reasonable thing to do. *I said misinformation for brevity, but generally am referring to self-contradictory statements, misinterpretations of physical laws, abuse of terminology, claims contradicted by many good experiments, mathematical errors, statements that about data that contradict what the data says, other clear misinterpretations or misrepresentations of results, etc. You really can’t see how aggressive sounding your OP is can you. It’s not that I necessarily disagree with what you said but rather how you said it. I have offered in the past for people to PM me with specific suggestions, I am open to advice related to improving my communication skills. I am not sure how else you expect me to present the facts other than a quote of the most recent broken promise, and a list of the primary incorrect claims. The proof of my statements about those claims has been provided repeatedly. After a dozen times, there really isn't much fluff I can add. This conversation is tangential to the actual topic, further meta-discussion of my wording can happen in PM, I won't reply to you again about this in the thread to keep things on topic. Don't know how to tell you but your analysis of EmDrive is not correct. You apply equations that do not model how EmDrive, when accelerating, creates assymetric radiation pressure. Suggest you model what happens when a resonant cavity is accelerated small end forward by an external force. You might find the assymetric Doppler shifts & resultant assymetric radiation pressure of interest. Or not. As for dates, when it happens it happens. By don't know how to tell me do you mean that you are unable to provide a single bit of math to support your statement? Because that is true, there are multiple times you have been asked to do the math for a simple situation to support your points and your never answer those questions. False. I am using general statements based on the definition of conservation of momentum. Shawyer claims no new physics is needed to explain the emDrive, so therefore he (and you) cannot provide a consistent argument against these points. The equations of electrodynamics clearly say that a cavity accelerating under an external force would feel a very small force in the opposite of the direction of acceleration. This is not only not the direction claimed by Shawyer, but since it is just the equivalent of the cavity mass being increased by the total amount of electromagnetic energy contained inside of it according to the relation E = m*c^2, the net effect is negligibly small, and in no way generates useful propulsion. You are the one who needs to go back, look at the history of past conversations and answer some of the simple questions you have ignored. A date that never gets any closer is one that is never going to happen. You have been working for years on a project that should have something to show (probably null results) within months. The complete lack of results says something. You must to invert cause and effect in your explanation. But, do you already knows how to do that? The radiation pressure model, whether based on bouncing photons or EM waves has been thoroughly addressed in the past. Even if the fundamental idea were not flawed it dies within the conservation of momentum, over unity and violations of other basic laws of physics, raised by extension. It has seemed to me that Shawyer began with an engineering puzzle based on a fundamentally flawed theory. He may have stumbled on a mechanism that generates a “very small” anomalous force. That does not validate the flawed theory, or speculations of flying cars and potential relativistic velocities (over time). The only thing it should suggest is a need to reexamine the engineering for a more realistic underlying mechanism. None of which can occur until a working device is made available for testing and study by multiple independent labs. What has been happening instead is that the design and theory have been evolving before indepent verification and and replication of Shawyer’s early claimed results. Some while back in a PM exchange you asked me what tests/experiments I would like to see to address the issues I had raised. I did not answer at the time for a number of unimportant reasons. I quoted the above only for your comments about CoM and have a question, based loosely on the following. The question: Does physics require that CoM involve an outside force or is that only a reflection of classical experience? Or as crudely described below could the interaction be between the resonant EM field inside the frustum and induced EM field in the frustum walls? I am not yet fully convinced there is “nothing there”, nor that there “is”, but I believe that if there is, it is far more likely to be a fragile electromagnetic interaction between the resonant EM field and the induced electromagnetic properties in the frustum walls... This would switch the CoM issue to one of could the properties of the EM field induced in the frustum walls, be pushing off of the resonating EM field itself? If so one could expect in the lab, on a test bed designed to measure force, an initial force as the EM field is introduced. A problem would be that when the device is held essentially stationary that initial “spike” would disappear as it turns into an undetectable GHz jitter overwhelmed by other noise. Since this would also be an almost insignificant EM interaction isolating the affect may require the higher power levels of the earlier magnetron tests. 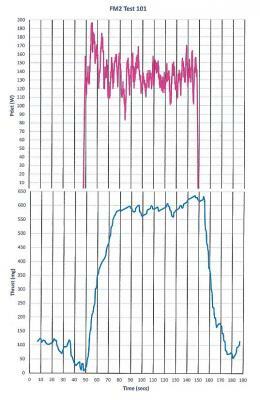 It would seem you could only test for the initial surge as the device is turned on with any in lab test equipment. The device would have to be free to move for the two fields to maintain an interaction resulting in a directional force. A device in orbit, or in a lab on a turntable with an inherent resistance to motion (both from friction and perhaps inertia), less than the very small expected anomalous force. Why do you [meberbs] have to post in such an aggressive way. It’s one of the reasons I’ve stopped looking on this thread. You seem to feel it’s your right to stamp on anyone on here who posts something you don’t agree with. In gaming context, it means quit complaining about losing. Get good. In the context of this ongoing thread, "get good" would imply getting one's math skills up to meberb's at the least. At the most, float the device across the conference room table, and he will change his tune. It's not about opinions and feewings.